Now, using the Doppler effect to add a third dimension to their data, the scientists have been able to measure the speed of the moving plasma, as well as its direction, temperature and density. Using several years' worth of observations, they were able to build up a more complete picture of the magnetic field structure that supports the plasma, in structures known as prominences. 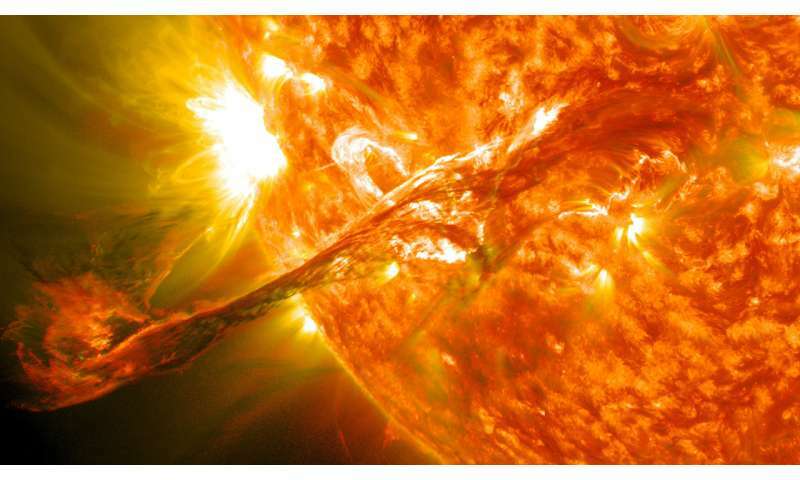 Dr Nicolas Labrosse, lead scientist in the study, explains: "We found that despite how prominences and tornadoes appear in images, the magnetic field is not vertical, and the plasma mostly moves horizontally along magnetic field lines. However we see tornado-like shapes in the images because of projection effects, where the line of sight information is compressed onto the plane of the sky." A solar tornado observed by the NASA satellite SDO between April 23-29, 2015. The tornado prominence erupted on 28 April. An image of the Earth is superimposed for scale. Credit: Credit: SDO data courtesy of NASA. 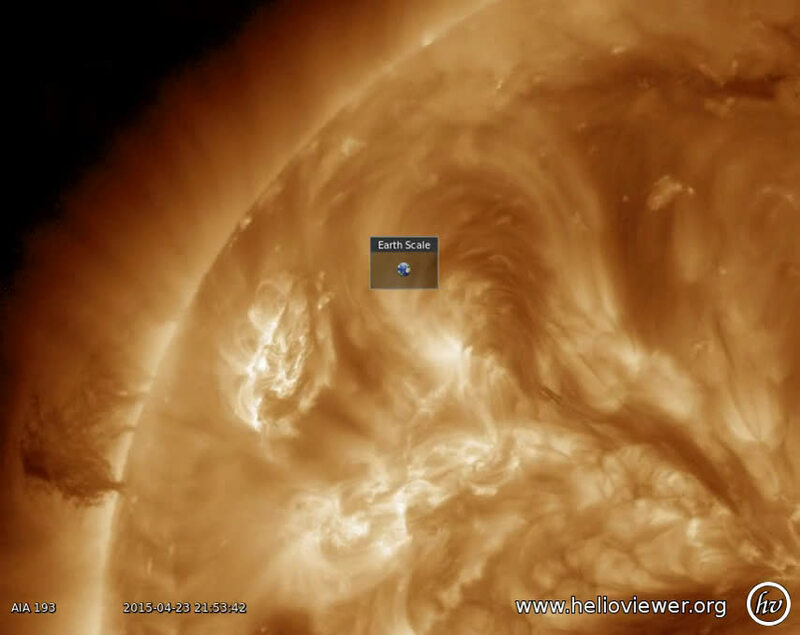 Movie created using the ESA and NASA funded Helioviewer Project. Dr Arturo López Ariste, another member of the team, adds: "The overall effect is similar to the trail of an aeroplane in our skies: the aeroplane travels horizontally at a fixed height, but we see that the trail starts above our heads and ends up on the horizon. This doesn't mean that it has crashed!" Giant solar tornadoes - formally called tornado prominences - have been observed on the Sun for around a hundred years. They are so called because of their striking shape and apparent resemblance to tornadoes on Earth, but that is where the comparison ends. "They are associated with the legs of solar prominences - these are beautiful concentrations of cool plasma in the very hot solar corona that can easily be seen as pink structures during total solar eclipses," adds Labrosse. "Perhaps for once the reality is less complicated than what we see!" comments Dr Brigitte Schmieder, another scientist involved in the work. She continues: "Solar tornadoes sound scary but in fact they normally have no noticeable consequences for us. However, when a tornado prominence erupts, it can cause what's known as space weather, potentially damaging power, satellite and communication networks on Earth." 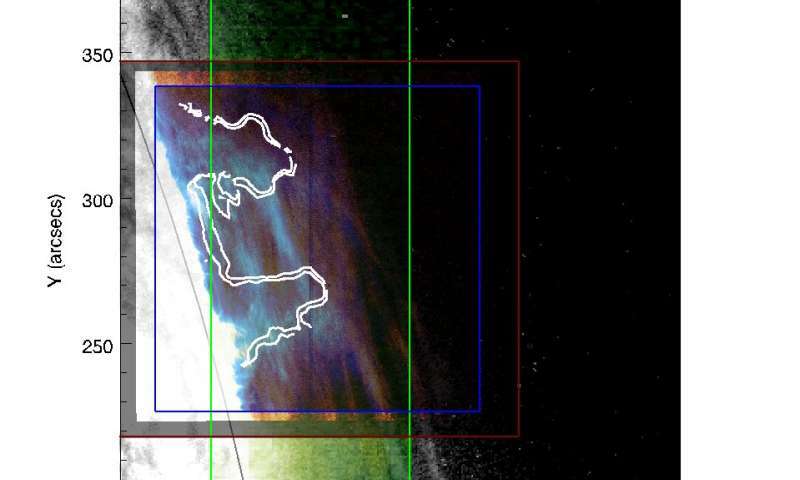 : "We found that despite how prominences and tornadoes appear in images, the magnetic field is not vertical, and the plasma mostly moves horizontally along magnetic field lines. However we see tornado-like shapes in the images because of projection effects, where the line of sight information is compressed onto the plane of the sky." Me thinks there is a disconnect between observation and theory. I wonder if these guys looked at this from a field-aligned perspective? These are not exactly tornadoes, a little more spin would not go amiss, the plasma is simply following the magnetic field lines. I thought there was a central core where there's no plasma.